Other Locomotives - Like many railway modellers I am an inveterate dreamer. The following are a few locos for possible future projects, or, just because I like them! 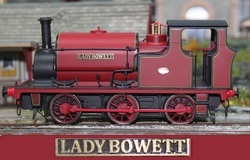 Lady Bowett - Hudswell Clarke 0-6-0ST - This is the Ixion Model superbly weathered by Chris Clark. It will run in the future (well, maybe) on 'Y Goppa' an 'O' Gauge GWR/Colliery interchange yard. Petrolea - Fowler 4xPM - Again, the Ixion Model repainted and weathered by Chris Clark; he just makes a good model better! Another one for Y Goppa. The loco is DCC with the EDM sound chip fitted - absolutely superb. You can run this loco to and fro on a yard of track and it is a crowd pleaser. 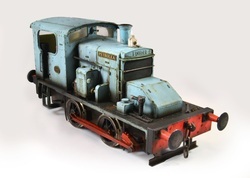 Manning Wardle Class I 0-4-0ST - this is the S&D kit. I bought it because I liked it. No doubt it will find a home on Y Goppa but I don't know if I have the heart to weather it! 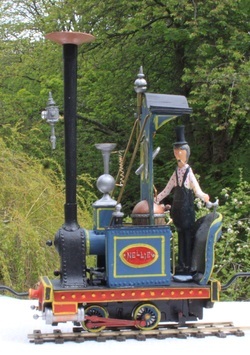 Nellie 0-4-0T. I have always loved the creations of Rowland Emett and when Smallbrook Studios brought out their kit I had to have one. I modified it slightly to more closely resemble the 'real' one, but as Nellie is different in every drawing Emett made ... She runs on 16.5 track, People openly laugh out loud at the sight of her. Model railways is fun!